Nikonians enjoying their brand new Nikon D300's will no doubt wonder how well this new camera can handle extreme cold temperatures. From the frozen expanses of Antarctica, LetsGoDigital has the answer. LetsGoDigital has just posted an article by Jan Vermeer with his impressions of the camera's handling characteristics in conditions he describes as "the driest, most windy and coldest place on the earth." His article is currently available in German, but if you don't speak the language, have no fear; - the images are universally self-explanatory. 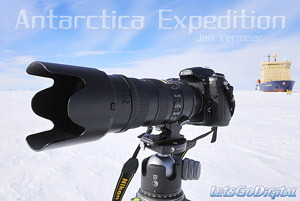 Check the large collection of Antarctica Expedition images in this special gallery.